Stitchings: Sewing has been a life-long practice for me, however in 1999, I learned of the work of Tewa Women United and the Shoshone elder, Corbin Harney and was inspired to use my recycled fabrics to make pieces that spoke about their efforts which honored Mother Earth. This experience, combined with my love of the land of northern New Mexico, led me to wonder: How would you sew a sunset? Or those Mountains? Or that tree? I decided to find out. Drawings: I work in the “style of Mimbres” because they taught me how to draw. Through studying and copying the photos in Dr. JJ Brody’s exquisite book, Mimbres Painted Pottery, I learned how to see things more their way. I am certain of their love for the land and all of nature, and I am inspired always by the complex simplicity in their use of line. I use pen and ink to make these designs. Imagine: they did all these lines and paintings with yucca brushes and natural materials. 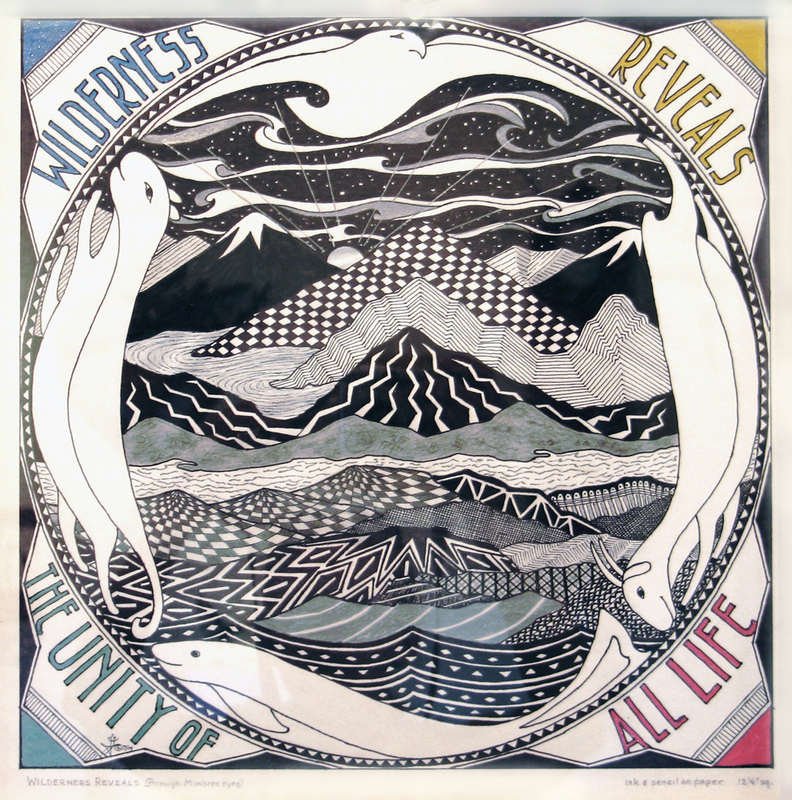 “Wilderness Reveals [Through Mimres Eyes]”, the series below, combines my drawings and stitchings in a way that I’ve never worked before. 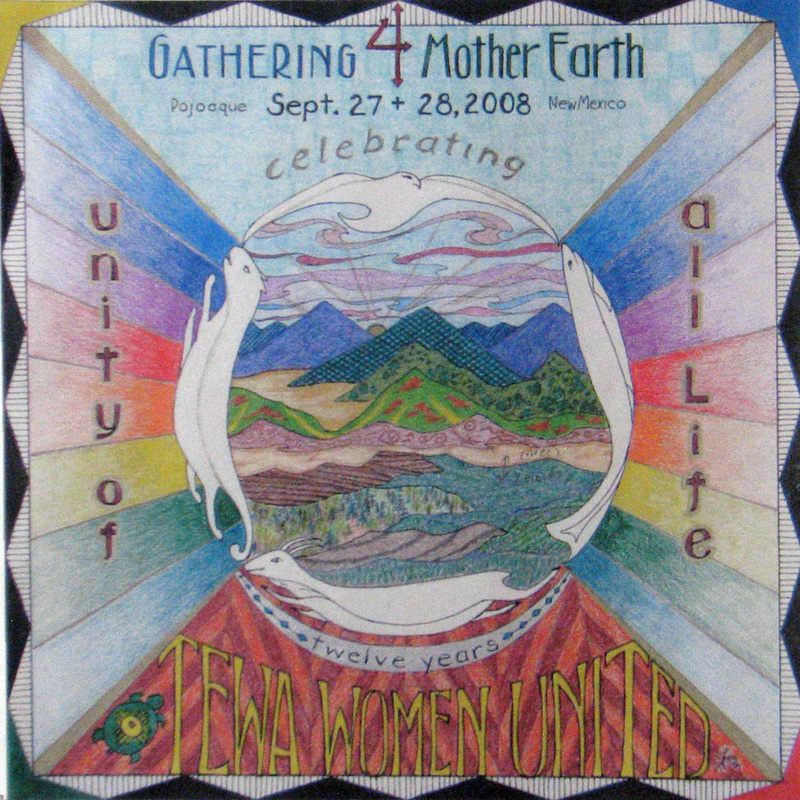 1st Stage, 2008: Small poster design for Tiwa Women United’s annual Gathering for Mother Earth. Saved photocopy; drawn with fabric-rendered in mind, but no idea how it could be done. 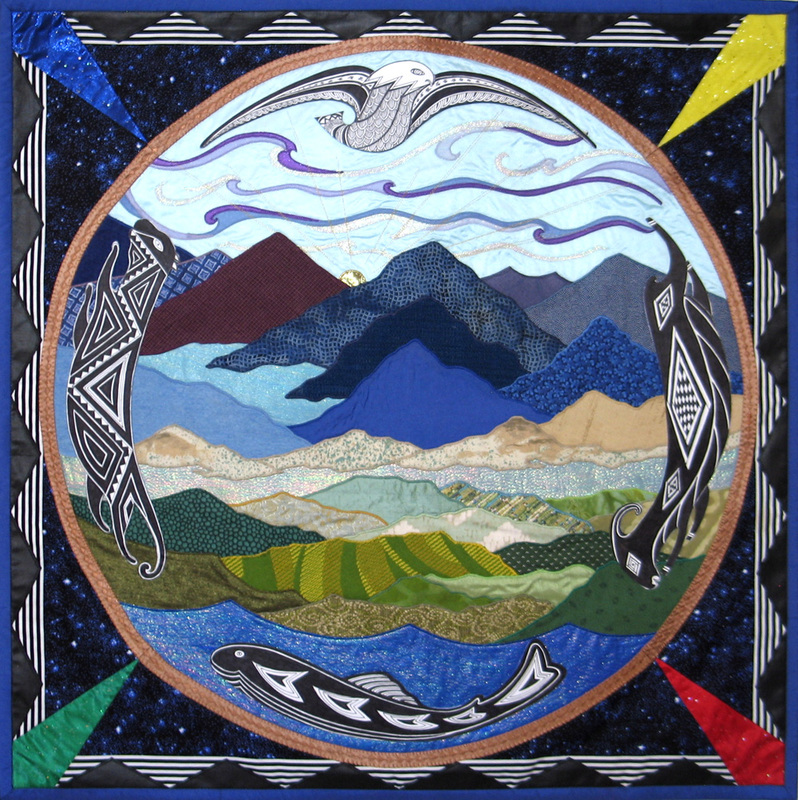 2nd Stage, 2014: Redesigned center section in Mimbres manner as entry for Wilderness Act 50th Anniversary Show; decided to make a fabric version for another show entry. 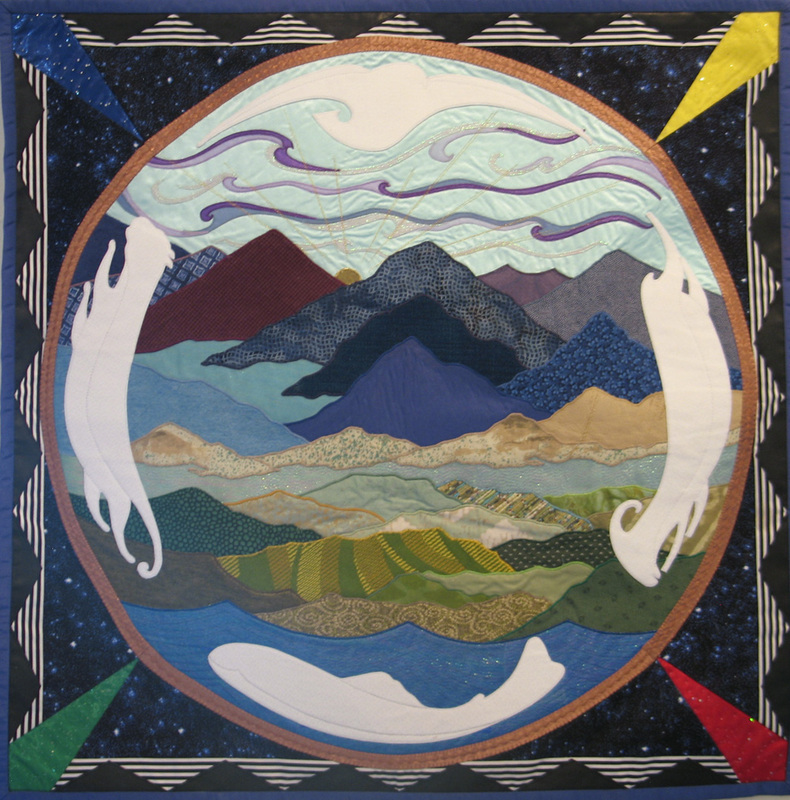 3rd Stage, 2014: Created mandala stitching for Wholly Rags’ “Artes de Descartes” art show at the Stables Gallery in Taos; also displayed in the Quilt Show at the Taos Library. 4th Stage 2015: Designed Mimbres pen and ink overlays applied to animal forms on Mandala for part of work as a Featured Wilderness Thinker. Please click on images below to see larger format slideshow. In 1953, at her school’s annual book fair, a 7-year-old girl bought a book which would affect the rest of her life: Catherine Christopher’s “The Complete Book of Doll Making and Collecting”, a “profusely illustrated guide” to designing and sewing many types of dolls and their clothes. 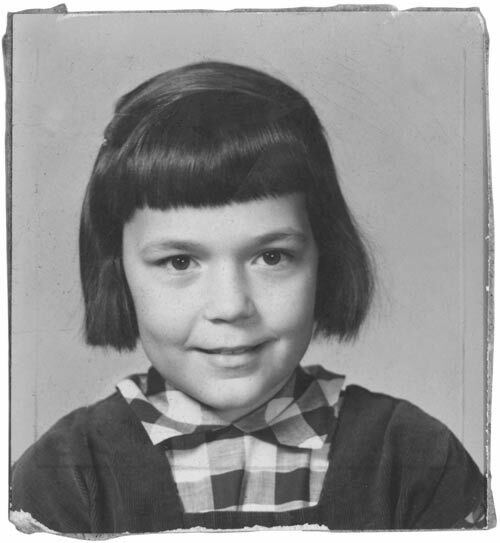 By age 10, the girl was making clothes for herself and toys for her “sibs”; by 15, drapery and throw pillows for her family home ; by 17, her college wardrobe; by 20, slipcovers, bedding sets and wedding ensembles; by 25, fabrications for entire houses, her own and hundreds of others; at 30, fun ideas for “daughter-stuff” from infancy through prom. Other work (administrator, secretary-bookkeeper, office manager, interior designer, kindergarten teacher, gallery helper, gardener-goatherd-camp counselor, farmer’s market organizer/participant) also came and went; but sewing stayed. In the early 1990’s, another book, “Mimbres Painted Pottery” by Dr. J. J. Brody, brought drawing into her life. Having first fallen in love with Mimbres work when she moved from the East to Southern New Mexico at age 20, yet lacking a background in art, this book prompted a learn-as-you-go response. While fabric work has been the major focus in recent years, drawing is staging a comeback. See more of Starr’s work at ochozone.org/starr .